Climate Day at Natural Products Expo West moved beyond companies talking about climate challenges to committing to real change. Here's how the movement looks and how to join. I had the pleasure of hosting an all-day #ClimateDayChat Twitter chat during Climate Day at Natural Products Expo West 2017. While I’m passionate about science, I consider myself the smallest version of a climate change advocate. I strongly support those who can help reverse climate change, but me myself? I have no idea what I can do as a consumer, other than vote—at the voting booth and at the grocery store with my dollar. I’ve got a lot of passions—from autoimmune disease awareness to animal shelters; it’s hard to decide which passion I have time, energy and money to focus on. However, this day riled me up like I haven’t been in a while. Maybe it’s the current administration; maybe it’s the loss of having a woman in the White House; maybe it’s just because things seem so dire, but I think we all need to step up and make small changes to help reverse the destruction that’s already been done and truly make the world great again. The movers and shakers in the natural products industry—and those making climate change reversal happen—gathered in one room at Natural Products Expo West. Everywhere I looked, I spotted another rock star of the natural world. The keynote was visionary Paul Hawken from Project Drawdown. Other speakers included Birgit Cameron of Patagonia Provisions, John Foraker of Annie’s. The room was filled with climate champions from New Hope, Happy Family, Dr. Bronner’s, National Co+Op Grocers, Independent Natural Food Retailers Association, Organic Valley, Nature’s Path, REBBL, Nutiva, Numi, Guayaki, White Wave and others. Mother Earth is in dire straights. Global warming projections show that by 2100, Earth will be 4 degrees C warmer on average. While that seems small, it’s actually terrifying. Global warming is like a tea kettle (the earth) over a flame (greenhouse gasses plus short-lived pollutants) on your stove. Since the 1970s, we’ve turned the dial way up on the heat for the kettle. It’s science, and if you deny climate change, you’re denying science. Even the coal industry acknowledged something needs to be done. But what do we do? We’re told to reduce, reuse, and recycle—OK, that’s pretty easy to integrate into our lives. But sometimes we’re told to do more difficult things like using only public transportation or installing solar or driving a Prius. But we’re really just a small part of a much bigger picture. By putting our money toward brands taking climate action, consumers we can make a much bigger difference, and brands can earn loyalty with this unique selling point. According to Eric Pierce of New Hope Network, more than 64 percent of millennials stated that concerns about the planet impact what they buy. And consumers overall, mostly millennials and Gen X, are willing to spend more to support brands that conduct business in an environmentally responsible manner. As a brand, it’s time to commit to climate health and let consumers know. There are nine verticals of action to help fight climate change, presented by the Climate Collaborative. If you haven’t heard about regenerative agriculture, it’s time to think about carbon farming. Just by changing the way we farm, by stopping deep tilling, mono-cropping, and chemical fertilizer use—the Climate Collaborative estimates regenerative carbon farming practices could mitigate as much as 4 billion to 6 billion tons of CO2 equivalents a year or 10 percent to 12 percent of global human-caused emissions. The average consumer might think about setting the A/C unit down a few degrees or changing out lightbulbs to save energy. It’s a bit more intense for companies. They must think about building efficiencies, heating and cooling for instance, but also about product refrigeration, if necessary, and heating and cooling in manufacturing. Food waste is such a hot button right now—as we’re seeing in the rush to buy products made from ugly fruits and vegetables or from food waste. Shockingly, the Climate Collaborative showed that globally, food waste contributes about 8 percent of total greenhouse gas emissions—nearly as much as global road transport emissions. There are ways to reduce waste at every step of the process, including just reducing the volume of surplus food generated. If you remember watching Ferngully as a kid like I did, I realized from a young age that deforestation is a terrible thing, but what am I supposed to do? It’s about supporting companies that commit to reversing deforestation, protect communities of wildlife and indigenous people, and support biodiversity. Use palm, soy, beef, paper and pulp from deforestation-free sources. According to the Climate Collaborative, packing accounts for 5 percent of the energy used in the lifecycle of a product. But this can be helped by considering the use of post-consumer recycled content, redesigning and reducing packaging used, and recycling at the end of life. Public policy is huge, especially under this administration. We need to make sure that our hard-working corporations pledging for a change aren’t hindered by policy. The Climate Collaborative states that about one-third of all the greenhouse gas emissions in the U.S. come from the burning of fossil fuels such as coal and natural gas to produce electricity. While only 13 percent of electricity in the U.S. is generated from renewable energy sources, it’s one of the most critical ways to fight climate change. Short-lived climate pollutants: Reduce short-lived climate pollutant emissions. I had no idea what short-lived climate pollutants were before I was told. They are quick but mighty, with a lifespan less than 15 years (not like carbon dioxide which is about 100 years). Short-lived pollutants are black carbon, methane and others. Methane, for example, is about 11 percent of greenhouse gas emissions—and no, not from cow farts—actually cow burps. But methane is also produced by some rice growing techniques that can easily be changed, as Lotus Rice is doing. Transportation: Reduce the climate impact of transportation. The Climate Collaborative estimates that greenhouse gas emissions from global freight movement are expected to quadruple by 2050. That’s pretty terrifying because the gas emissions from U.S. freight grew more than 50 percent between 1990 and 2013. There is new technology to increase truck and shipping logistics efficiencies. As a business, you need someone (or more) on your team doing assessments in each of these verticals to see if there’s anything you can do. As a consumer, it’s powerful to know that after we talked through these verticals, a certain “Oprah” type of moment happened. Businesses in the room were asked if they were willing to pledge to one or more of these actions. Business after business—from Nutiva to Stonyfield to Nature’s Path to Numi Teas—stood up and pledged how they would work to help the climate. Annie’s Homegrown, Lotus Foods, Happy Family, Rebbl, Dr. Bronner’s … it was like my cupboards and cabinets came to life and screamed that they weren’t going to stand still and take it anymore. It was a very powerful few minutes in the room during which the energy and excitement was palpable. There were so many brands moving forward with the Climate Collaborative that day, and I hope it doesn’t stop there. If you’re a brand—consider the Climate Collaborative and seeing how you can be the change you wish to see in the world. Another action consumers and businesses can take: Contact your senator or representative. I know that since November, we’ve been doing a lot of calling. But now is not the time to rest on your laurels. Did you know there’s a climate solutions caucus in the House of Representatives? Check out this bipartisan group that explores policy options that address the challenges of climate change. Online you can easily ask your representative to join, or thank members of the caucus. 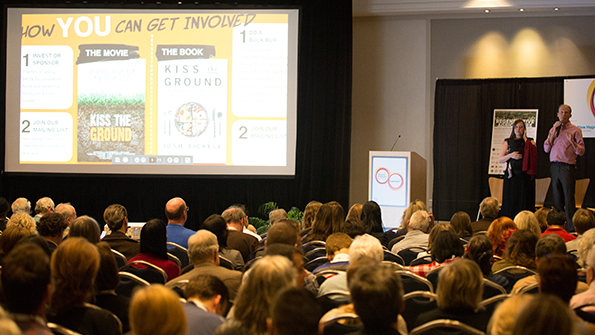 We finished the day by watching Kiss the Ground, and it solidified this magical day that took place in the ballroom at Natural Products Expo West. There were real people who want to make real change through business. But how do we get consumers to understand? Why is this so important? Kiss the Ground will do just that. From the brief portion of the film I got to see, I was so impressed. It presented a problem, but also helped us understand a solution and how everyone can help. I highly recommend this film when it comes out. Find out more about Kiss the Ground at the website. 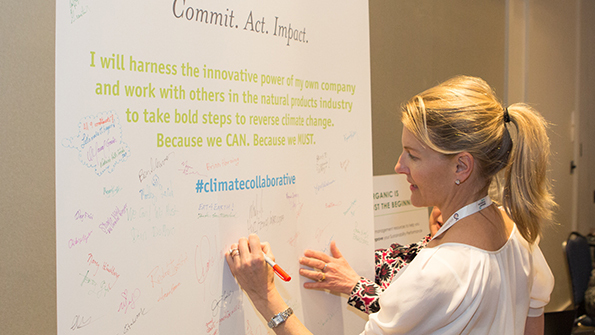 There were so many amazing things that happened at Climate Day at Natural Products Expo West. While many of the observations about where climate is at made me want to hide under the chair and cry, I really felt that there are brands out there that are doing the right thing, and we’re on the right path. >> Watch Natural Products Expo West Climate Day in this special live recording. Meat, the unlikely climate hero?